The statue of the young dancer faces the Royal Opera House in Covent Garden. Created by Enzo Plazzotta. It is Ninette de Valois born in Ireland, but finally settled in England where she established the Royal ballet, the Birmingham ballet and the royal ballet school. Nice composition in this photo with the statue and the snow covered lamp post behind her! This is a beautiful sculpture, it says everything. No words needed. I love this. I like it! Beautiful statue and great perspective! Gorgeous. Perfectly framed with the snow in the background. Lovely statue, so realistic and so beautiful with the snow in the back ground. Ciao. A.
Birmingham the city of my birth. This is such a gentle beautiful image. You made me curious! What a personality she must have been! Dancing with the best, creating... and living for 102 years! What a lady (or Madam)! She is certainly worth this nice statue! I love that she's rubbing her feet. Every dancer I know has real trouble with their feet. the sculpture is really beautiful , the rain drops add to its charm ! I loev the snow in the background!!! Wow that is a really cool statue. I used to be a ballerina. I would love to go to London someday. As a dancer i find this very interesting. 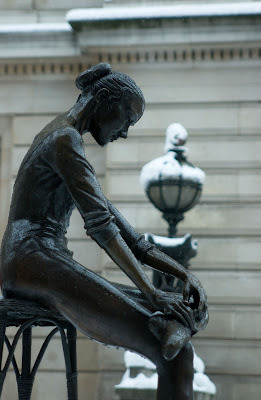 The statue of the girl is outside enduring the weather but is still putting on her pointe shoes. I dont know if it was made to seem as if she was strong but thats how i picture it. magnifique statue de danseuse sur fond de neige. Congratulations for your pretty good job. Showing this London's Point of view is so Refreshing!